One of the first things I noticed when I moved away from Utah was how expensive real life can be. A new wardrobe of business casual shirts and slacks seemed to cost a fortune. The 1-bedroom apartment I moved into, which was neither the least nor the most expensive option, cost $740/month, not to mention the first and last month's rent and security deposit. That sounds great now, living in Boston as we do, but it was a lot to fork out with those first few pay checks. A full-time salary meant what felt like king-size tax withholdings and tithing. It cost a couple thousand dollars to move from Utah to Texas. Add the costs of food, utilities, auto insurance, gasoline, auto repair and maintenance, our first anniversary cruise, a house, and all the things you buy with a home (lawn mower, ladder, clippers, and picture frames, to name a few), and it's easy to understand why I thought life had gotten pretty expensive, pretty fast. Around Christmas time, 8 months after we moved to Texas, I had had enough of spending money as fast as we could earn it. I remember clearly the frustration I felt at how much money we had earned and subsequently spent over the last 8 months. Janssen and I were driving our car back from Bergstrom International Airport late at night, and I told her of my financial frustrations. Her response was perfect. She agreed with me! Step #2: Support any movement your spouse makes in the frugal direction. Step #1 was to be an example. Don't stop this at the crucial moment, even if you want to go on that vacation or buy those new curtains. 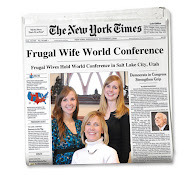 If your generally non-frugal spouse is feeling the urge to stop spending, throw yourself behind that initiative and lend a hand. He just might gain enough momentum for a jump start. Also, refrain from saying things like, "Oh, so NOW you want to be frugal. I've been frugal for the last three years and all of the sudden YOU want to be frugal. What brought on this sudden change in attitude, hmm?" That's not going to help your spouse. Rather, do as Janssen did (you can pay me later, J), by being agreeable and supportive. Your spouse just might have the same experience I had (to be continued in Part III). Hi, I came across your blo awhile ago and love it! I am now subscribed to you as well. Great job on the blog!